This research paper is to explore the mediating role of career commitment and moderating effect of self-efficacy between career development practices and career success of employee in insurance sector of Pakistan. Survey method was adopted to collect the data form 374 employees working in insurance sector systematic sampling. PLS-SEM technique was used using Smart PLS 2.0 to analyze data. Findings of this study suggest that employees’ career development practices have positive relationship with career commitment and career success and how self-efficacy effects the career success. Self-efficacy is the beliefs of employees about career success in insurance sector. Finally, career commitment mediates the positive role between career development practices and self-efficacy moderates the career success of insurance sector employees. The effect of career development practices on career commitment and effect of career development practices on career success has been checked in past studies but the mediating role of career commitment and moderating effect of self-efficacy particularly for the employees of insurance sector has not been checked before. A firm has been found very easy to measure the gains and losses of the firm through multiple financial tools but it rarely seen or discussed that what organization is doing for its employees or not by with the organization or with their career [1-3]. In the 21st century, career success is treated as the fundamental thought of human resource management in this competitive business world . In few years, more than 90 studies have been conducted on performance and productivity measurement of insurance sector of developed countries but not on the individuals (employees) of this service sector . In developing countries, insurance sector still remains low in generating the insurance premium  because they do not focus employees. Insurance industry is relatively a small and highly neglected sector of Pakistan . According to Year Book  of IAP, there are 35 insurance companies working in Pakistan and there are only 8933 employees working in all over the Pakistan. Pakistan’s insurance sector is using the conventional and long-established approaches, while developed countries are enjoying the benefits from insurance system . It has been reported that there is huge number of unemployed people in Pakistan and yet the insurance sector has not been able to attract the attention of that huge number of unemployed personal. According to Malik et al. people are not inclined towards insurance sector because of the poor performance of insurance sector, having no education, religious factor that insurance is considered prohibited, less understanding and lack of trust on the insurance personnel’s and companies . The employees’ career improvement becomes a cause of improvement in the working of the employees also, and this helps not only the company but also in the development of professional career . According to Okurame et al. the employees of the insurance companies need to be motivated incessantly to achieve higher levels of outcome not for the insurance sector, but for the employees’ career. A question of career success, career commitment, career strategies, career policies or career opportunities is answerless without the mutual interaction between employees and organization . Employees want to find a path and explore career in insurance sector. Job security and training as career development practices can build the employee’s career and it ensures the success factor in career . Job security and training development programs is the indicator of career success. According to Armstrong et al. , employee’s career development factors are the assets of the organizations and these factors which are job security and training are considered to be the foundation of employee’s career success. Supporting career developments needs will ensure career success in any organization but particularly in insurance sector . This research study suggests that job security and training development programs are key career development practices. This research study also suggests the impact of person’s belief on career success in the insurance sector. These career development practices play key role in term relationship for benefit of the employment and improving employee career commitment and career success by their stronger belief in insurance sector. The aim of this research article is to identify the relationship between job security and training on the career success with the mediation effect of career commitment and moderating effects of self-efficacy in insurance sector of Pakistan. In the existing literature, most of the studies focused on the factors such as job security and training, career views, career, self-efficacy and work issues as predictors influencing employee career commitment, career success [16,18,19]. In the context to Pakistan, studies conducted on service sectors like bank and insurance sector but, especially none of these studies concentrated on the employees’ career commitment and career success in insurance sector. In Pakistan, the insurance sector has not been able to meet the standards and goals because it is also challenged by a number of dares, one of which is the employees and lack of skills and poor salary, no job security and lack of learning’s because of trainings. This has prohibited the growth of Pakistan insurance industry. • Job security also effect on the career success. In the latest study  recommended that insurance companies should design and implement career development programs such as training programs, and job security for employees to be committed to their careers and get success into the insurance sector. On the other hand, Barley et al. focused on the fact that employee play key part in breaking and making of any organization. Insurance and banking sector are considered as financial and service sectors but still insurance sector is the ignored by government, policies and religious views. Career success is defined as dependent variable in this research. The term career success means achieving the intended goals and ambitions . Career success is somewhat that is developed and maintain with the passage of time, naturally influenced by many causes that are intrinsic and extrinsic to the individual as well as to the organization regardless of time . According to Rasdi et al. that the primary themes of profession, work, time and hierarchical structure, reflecting a person’s occupation, which predict to a person’s career success in his or her life. Career commitment has been important due to its strong connection with work and individuals . Career commitment can also be described as positively related to career involvement and its commitment [26,27]. The attitude of individual towards his profession and career involves the individual’s development, goals, identification and participation in defined objectives [26-28]. According to Janjua et al. the insurance industry of Pakistan is neglected, if we compare it other regional upcoming economies but at the same time it definitely has vast potential in it to grow into a huge and big industry. In 2010 premium was 11% in developing economies, world average was 2.7% while in Pakistan it had been low than average . So the real aim and goal of the research is to measure the influence of career development practices on the career success and career commitment of employees. Employees that have high levels of job fulfillment are more committed to their careers, through training and development and job security [20,30-32]. According to Armstrong , Herzberg  that skills development, training and career development opportunities are interrelated factors [21,34]. It is very much clear that the fear of losing job or having a sense of insecurity about job is positively correlated and connected with career commitment and career success in dynamic work environments of today’s world. Hobfoll  states that stress is created when people experience threat or actually loses their valuable resources. The elements including job security would positively influence to sense of career success in the minds of the employees . It is obvious that job security is directly connected to career success . Employees need mental satisfaction to perform better and to show their performances and the feeling of job security is one of such element that provides this satisfaction . It means that they must actively pursue training and development opportunities to be successful in their career. Since, training activities like on job training, providing guidance, and counseling can contribute insurance sector to generate a group of knowledgeable, motivated and dedicated employees who are capable to boost and stand career skills in the insurance sector . The self-efficacy will moderate career success because of person’s belief about the insurance sector. Self-efficacy is defined as the moderating variable between career commitment and career success. According to Bandura  self-efficacy means a belief and course of action and it’s important to recognize the working employee self-efficacy in the insurance sector of Pakistan. Self-efficacy has a significant impact on career success [41-43]. Individuals' beliefs to execute the course of actions for occupational tasks and career success of employees [43,44] in insurance sector of Pakistan which is neglected and may influence of negative beliefs of people. Self-efficacy influence the level of career success of employees who are highly career committed . Appropriate training and training strategies will ensure and guide that it would be most effective in the execution of career success and career commitment . Many researchers like Ugboro et al. , Creed et al. , Wan et al. confirms that the career commitment will affect the performance of both organization and employees. However, lower level of career commitment will affect the career success [48,49]. H1: There is a relationship between job security and career commitment. H2: There is a relationship between training and career commitment. H3: There is a relationship between job security and career success. H4: There is a relationship between training and career success. H5: Career Commitment is a mediator between job security & career success. H6: Career Commitment is a mediator between training & career success. H7: There is a relationship between career commitment and career success. H8: Self efficacy will moderate the relationship between career commitment & career success. This research framework was designed to portray the variables integrated in this study trace their relationship to detect their influences on career success (Figure 1). This model shows the mediating relationship of career commitment between CDP (job security and training) and career success moderated by self-efficacy. Figure 1: Theoretical framework of employees career development practices, career commitment, self-efficacy and career success. For the present study, the variables to be measured are career success, career commitment, job security, training and self-efficacy. To measure the career development practices (job security and training) and its impact on career under the mediating role of career commitment, a total of 34 items were used, which were adopted from Rehman ; Subbaiah ; Greenhaus et al. ; Chen ; Kong . A self-administered questionnaire, based on 5-point Likert scale from “1” as “strongly disagree” to “5” as “strongly agree” was employed to measure all items. The population for this research consists of all the employees in the insurance sector in Pakistan. According to the Insurance Book , there are nearly 9,000 employees in this sector. Stratified sampling techniques are followed to carry out this study. The employees working in the insurance sector of Punjab, Sindh, and KPK Pakistan will be the target population for this study. The data have been collected using self-administered questionnaires. The respondents have been selected by using stratified sampling as stated earlier. The questionnaires (650 in number) have been distributed among the randomly selected employees. Out of 650 questionnaires, 350 were distributed in Punjab, 200 in Sindh and 100 in KPK. A total of 386 questionnaires were finally retained for analysis that was collected back from the respondents. The retained questionnaires were 182, 143 and 61 from Punjab, Sindh and KPK provinces. The usable questionnaires from Punjab were 179, 138 from Sindh and 57 from KPK. The response rate was 59.38%. The usable response rate is 57.54%. With all variables used in research, respondents were also questioned to indicate the number of aspects related to job description, individual characteristics, education and gender of the employees working in the insurance sector of Pakistan. The descriptive analysis in Table 1 revealed that 31.3% employees are working as managers in different insurance companies and 68.7% employees are working as sales and marketing executive in insurance sector of Pakistan. This also indicates that most of the employees are related to sales and marketing job in the insurance sector. This analysis revealed that 81.3% males and only 18.7% females are working in the insurance sector of Pakistan. Only 3.5% of employees have completed matric or below in education, 9.6% have completed intermediate (Figure 2). 32.6% employees are graduates and 51.1% have completed their master level. This analysis also shows that 3.2% employees in insurance sector have completed higher education which is above than master level. Table 1: Summary of Respondents’ Demography. The construct measures is evaluated and determined by reliability and validity. After confirmation of the construct measures, the structural models were evaluated and analyzed the relationships between the latent variables. The PLS-SEM was used to investigate the direct, mediating and moderating role between career success and career development practices. 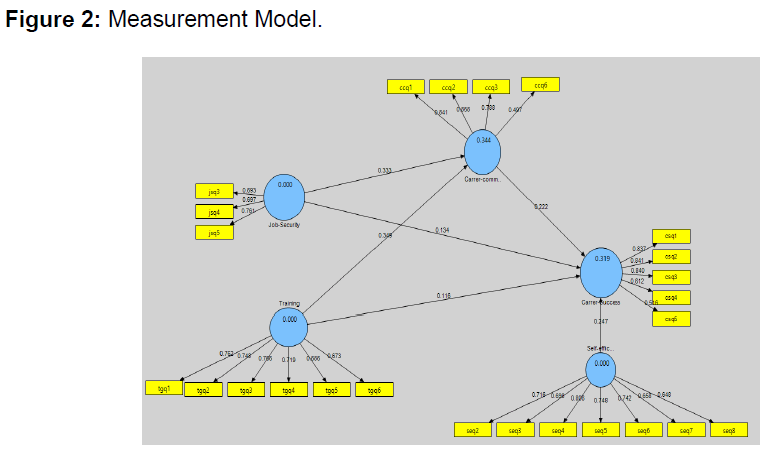 For this purpose, SmartPLS 2.0 software was used to ascertain the causal links (associations or connections) among the constructs in these theoretical models. In this study, all the indicators of latent (unobserved) variables are reflective. In terms of the sequence and relationship among the constructs, the study has exogenous variables and endogenous variables which include two independent variables namely job security (JS), and training (T), one mediating variable career commitment (CC) and one moderating variable self-efficacy (SE) and career success (CS) as dependent variable. Table 2, indicates that the factor loadings exceed threshold of 0.50 or above showing acceptable involvement of the indicators. The discriminant validity can be evaluated by inspecting the outer loadings of indictors. Table 2: Factor Loading/Cross Loading. For the first time the PLS algorism was computed, there were some items that loaded extremely poor, for example, following items are not included in the PLS algorism, CCQ4 (question sequence # 9), CCQ5 (question sequence # 10), JSQ1 (question sequence # 25), JSQ2 (question sequence # 26), TG7 (question sequence # 36), TG8 (question sequence # 37), TG9 (question sequence # 38), TG10 (question sequence # 39) and SEQ1 (question sequence # 40), because deletion of these items lead to increase in CR and AVE of all these constructs to the minimum acceptable values. Convergent validity is the defined as a particular scale measures the same construct, and it is assessed for all the variables by investigating the composite reliability (CR), AVE, items factor loadings and outer loadings . Convergent validity is shown when the value of AVE for each construct is greater than 0.5, the value of CR is greater than 0.7, the items load on their respective construct is greater than or equal to 0.7, and the value of t-statistic of the outer loading is greater than 1.96. Table 3 depicts the dependent variable, the CR of CS is 0.856 and CR for independent variables JS and T is 0.761 and 0.870 respectively, while CR for moderating variable SE and mediating variable CC is 0.881 and 0.840 respectively . The value of AVE greater than 0.5 for each construct is another evidence of convergent validity. The results in Table 3 shows strong convergent validity because altogether constructs have an AVE above 0.5. Similarly, Table 3 display convergent validity, all item loadings (outer loadings) above 0.6, suggests that more than half of the variance is netted by the constructs. The most common approach in evaluating discriminant validity is Fornell-Larcker criterion. Discriminant validity was assessed for CS, CC, JS, T, and SE. Discriminant validity is established when the square root of AVE of each construct is higher than the correlation of the construct with any other latent construct . Fornell-Larcker Criterion results are shown in Table 4. The square root of value of AVE (in bold) is greater than its highest correlation of construct. Thus, it is decided that discriminant validity on the construct has been established, therefore, it is anticipated that the results obtained relate to the hypotheses testing should be valid and reliable. Lastly, in this study outer factor loading is considered as important criteria in order to assess contribution of indicator to assigned construct was examined. The threshold values of 0.5 or above should be used to examine the outer loadings . After getting a good result of the evaluation of the measurement model (outer model) precisely, the latent variables suggest satisfactory evidence of reliability and validity, the next step was evaluation of structural model (inner model). The evaluation of the structural model begins with an investigation of the direct relationships among the independent, mediator, moderator and the dependent variable. The path coefficients’ size was examined through PLS-SEM Algorithm, and the significance of the relationship was examined through PLS-SEM bootstrapping procedure in the SmartPLS 2.0 software . The valid number of observation in data set was used as the number of cases, and 5,000 was used as number of bootstrapping samples. In this model, first it is focused on the analysis of the direct relationship between independent and the mediator variable (H1 and H2). In second step, the relationship between independent variables and the dependent variable is analyzed (H3 and H4). In the third step, the significant relationship is examined between CC as mediator and CS as dependent variable as H5 and H6. In the fourth step, the mediation of CC analysis took place, where H7 were examined between CC as independent variable and CS as dependent variable [60-62]. Hypothesis H8 is carried out by examining the moderating relationship of SE with CC and CS. Figure 3 shows the path coefficient of exogenous and endogenous variables. The result shows that all the exogenous variables have a positive coefficient with the dependent variable. In Figure 3, the bootstrapping result shows that the relationship between independent variables and the dependent variable is significant statistically as p<0.01; two of the independent variables are significant at p<0.05. Table 5 presents the results of the path coefficients, t-values and p-values. Figure 3: PLS Algorithm Direct Relationship. Table 5: Results of Hypotheses Testing (Direct Relationships). The mediator variable was presented to assess the relationship between the independent variables and the dependent variable. The moderator variable is also used between mediator and dependent variable . With respect to H1, the result shows a positive impact of JS on CC (β=0.332; t=6.390; p<0.000); therefore, supported H1. However, the result shows significant influence of T on CC (β=0.348; t=6.630; p<0.000) and supporting H2. About H3, the result shows a significant positive influence of JS on CS (β=0.133; t=2.337; p<0.010); so H3 is also supported . H4 results shows significant influence of T on CS (β=0.116; t=1.736; p<0.042); so H4 is supported. Additionally, H7 results shows the significant positive relation between CC and CS (β=0.222; t=2.986; p<0.001); so H7 is supported. The bootstrapping result in Figure 3 shows that all the relationships are significant including the variable with a negative coefficient at p<0.01 and p<0.05. Table 5 also presents the path coefficients, t-values and p-values. As shown below in Figure 4 the path coefficients of the two independent variables are positive. The path coefficients have a positive sign of all independent variables. Also, the path coefficient is positive between the mediator and dependent variable. The bootstrapping result found in Figure 4 shows all the relationships are significant and positive coefficient. 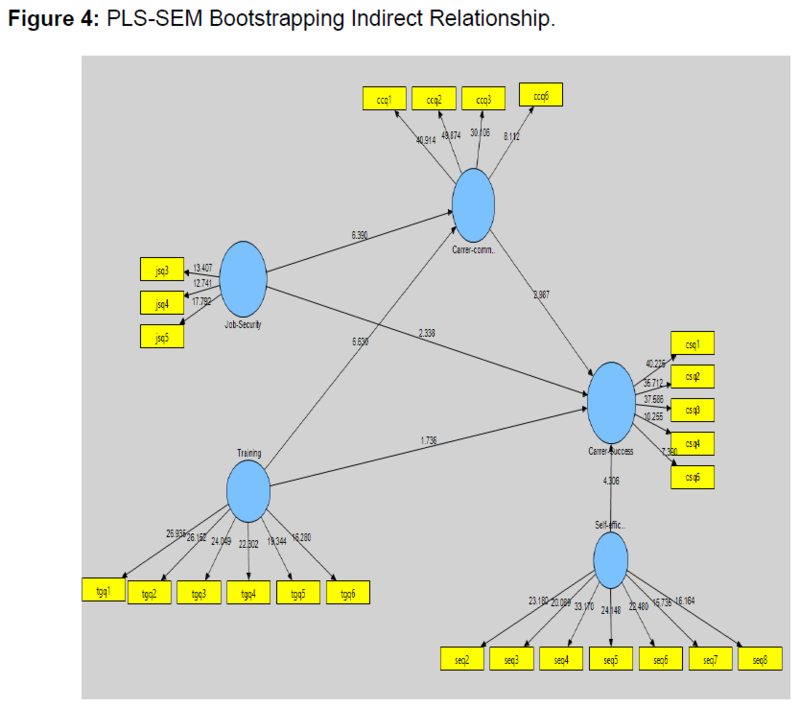 Figure 4: PLS-SEM Bootstrapping Indirect Relationship. Mediation analysis assesses the indirect effect of the independent variable on the dependent variable via an intervening variable. According to Hoyle and Robinson, there are numerous techniques for assessing mediation, which include: causal steps strategy or serial approach. Baron and Kenny also referred different conditions for it. The bootstrapping method begins with estimating the path model of a direct relationship between the independent and the dependent variable without use of the mediator. The path models of direct relationship include the path coefficients and t-values using PLSSEM algorithm and the bootstrapping procedure . In the second stage, the path model is estimated with the mediator variable, where, the focus is on whether the relationship of independent variables and the mediator and also relationship of mediator and dependent variable are significant. This is necessary but not sufficient reason of mediation effect. Lastly, the product of the two significant path coefficients is divided by the standard error of the product to test the significance of the indirect effect. After including the mediator construct, CC in Figure 4, the bootstrapping result of 5,000 samples was used to multiply path a and path b. Then the product of the two significant paths was divided by the standard error of the product of the two paths to get the t-value . From Table 6, it is clear that CC mediates the positive relationship between JS and CS (β=0.120; t=5.198); supporting H5. T and CS (β=0.078; t=3.736) supporting H6. Results of the study shows that in the indirect effect of job security and career success is significant having values of confidence interval (LLCI=0.074, ULCI=0.165). Both lower level confidence interval (LLCI) and upper level confidence interval (ULCI) are positive. Hence we conclude that the career commitment having the mediating role in the relationship of job security and career success. In the indirect effect of training and career success, relationship is also significant because of positive values (LLCI=0.037, ULCI=0.120), so there is mediation . We conclude that the career commitment having the mediating role communicated with job security and career success as well as training and career success. Table 6: Hypothesized Path Coefficients. Table 7 indicates a relationship between CC*SE and CS (β=-0.113; t=5.798; p<.05). Hence, it is concluded that SE has a negative influence on CS and the level of R2 that is accounted for the model improves from 0.26 to 0.27. Table 7: Moderating testing (inner modelling Analysis). Table 7 shows, there is a significant addition of the R2 level that remains at 0.27. The interaction term found to be statistically significant as shown in Table 7. Current result indicate that the interaction term of CC*SE is significant (β=-0.113; t=5.798; p<.000); hence, H8 is supported. We proposed an evolving process of career success and career commitment of working employees of insurance sector of Pakistan. Up till now, we have raised several important issues to consider career development practices of working employees of insurance sector of Pakistan. It has been discussed the major factors and variables which are important and have a positive effect and relation on the employees’ career commitment and career success. The results and outcomes indicates a matter that career is a major function for employees but we have endeavoured to explore that career development practices like job security and training to build career commitment and career success of working employees of insurance sector. the self-efficacy belief of individuals which make it negative. It’s the belief of employees about insurance sector. Its results are different because of the religious concepts and misunderstandings about the insurance sector. Individuals have negative approach towards insurance sector and don’t want to join it as career because insurance is not allowed in Islam. It will be truly very helpful for the employees of insurance sector, first focus on their career by giving them career development opportunities to develop their career and career skills. Career development practices help them to be committed with their career in insurance sector and it will lead towards career success. On the second step help employees to build their belief and change their mind about the insurance sector to work in it as career development. For real benefits and for potential employees and for the growth of insurance sector of Pakistan it is very important to implement career development practices for employees to be committed and successful in their careers. Gunz H, Mayrhofer W (2015) The Social Chronology Framework: A Multiperspective Approach to Career Studies. SSRN Journal. Katre A, Salipante P (2012) Start-Up Social Ventures: Blending Fine-Grained Behaviors from Two Institutions for Entrepreneurial Success. Entrepreneurship Theory and Practice 36: 967-994. Hinchcliffe D, Kim P (2012) Social Business by Design. San Francisco: Jossey-Bass: A Wiley Imprint. Giannakis D, Harker M (2014) Strategic Alignment between Relationship Marketing and Human Resource Management in Financial Services Organizations. Journal of Strategic Marketing 22: 396-419. Eling M, Luhnen M (2010) Efficiency in the International Insurance Industry: A Cross-Country Comparison. Journal of Banking and Finance 34: 1497-1509. Outreville J (2012) The Relationship between Insurance and Economic Development: 85 Empirical Papers for a Review of the Literature. Risk Management and Insurance Review 16: 71-122. Salman M, Baig A (2014) Effect of Organizational Ethics on Job Satisfaction of Non-Life Insurance Employees in Pakistan. Pakistan Business Review 542. SBP (2013) Insurance Year Book 2013-2014. Etienne C, Asamoa-Baah A, Evans D (2010) The World health report. Geneva: World Health Organization. Malik H, Ahmad Gujjar A (2012) Job Satisfaction: Evaluation of State Life Insurance Corporation. International Journal of Social Science and Education 2: 519-530. Allen D, Shore L, Griffeth R (2003) The Role of Perceived Organizational Support and Supportive Human Resource Practices in the Turnover Process. Journal of Management 29: 99-118. Salanova M, Llorens S, Acosta H, Torrente P (2013) Positive Interventions in Organizations Positive Interventions in Positive Organizations. TERAPIA PSICOLOGICA 31: 101-113. Okurame D, Balogun S (2005) Role of Informal Mentoring in the Career Success of First-Line Bank Managers. Career Development International 10: 512-521. Kirkbesoglu E, Ozder E (2015) The Effects of Organizational Performance on the Relationship between Perceived Organizational Support and Career Satisfaction: An Application on Insurance Industry. Jmr 35. Yean T, Yahya K (2013) The Influence of Human Resource Management Practices and Career Strategy on Career Satisfaction of Insurance Agents. International Journal of Business and Society 14. Armstrong M, Taylor S (2014) Armstrong's handbook of human resource management practice. Kogan Page Publishers. Khilji SE, Wang X (2007) New evidence in an old debate: Investigating the relationship between HR satisfaction and turnover. International Business Review 16: 377-395. Eddleston KA, Baldridge DC, Veiga JF (2004) Toward modeling the predictors of managerial career success: does gender matter? Journal of Managerial Psychology 19: 360-385. Nabi G (2001) The Relationship Between HRM, Social Support and Subjective Career Success among Men and Women. International Journal of Manpower 22: 457-474. Maxwell GA, Ogden S, Broadbridge A (2010) Generation Y's Career Expectations and Aspirations: Engagement in the Hospitality Industry. Journal of Hospitality and Tourism Management 17: 53-61. Adeoye A, Fields Z (2014) Compensation Management and Employee Job Satisfaction: A Case of Nigeria. Journal of Social Science 41: 345-352. Barley Stephen R, Gideon K (2001) Bringing Work Back in. Organization Science, 12: 76-95. Shah S (2005) Career success of disabled high-flyers. Jessica Kingsley Publishers. Mohd Rasdi R, Ismail M, Uli J, Mohd Noah S (2009) Towards developing a theoretical framework for measuring public sector managers' career success. Journal of European Industrial Training 33: 232-254. Carson KD, Bedeian AG (1994) Career commitment: Construction of a measure and examination of its psychometric properties. Journal of Vocational Behavior 44: 237-262. Blau G (1989) Testing the generalizability of a career commitment measure and its impact on employee turnover. In Academy of Management Proceedings. Academy of Management 1989: 53-57. Goulet LR, Singh P (2002) Career commitment: A reexamination and an extension. Journal of vocational behavior 61: 73-91. Kalleberg A, Berg I (1987) Work and Industry: Structures. Markets, and Processes New York: Plenum. Janjua P, Akmal M (2014) A Comparative Analysis of Customers' Satisfaction for Conventional and Islamic Insurance Companies in Pakistan. International Journal of Economics and Finance 6: 36-50. Brevis T, Vrba MJ (2014). Contemporary management principles. Chaudhary R, Rangnekar S, Barua MK (2012) Relationships between occupational self-efficacy, human resource development climate, and work engagement. Team Performance Management: An International Journal 18: 370-383. Mathis LR, Jackson HJ (2012) Human Resource Management: Essential Perspectives. USA: South-Western Cengage Learning. Armstrong-Stassen M, Cameron S (Career Development International). Factors related to the career satisfaction of older managerial and professional women. 10: 203-215. Herzberg F (1966) Work and the Nature of Man. Cleveland: World 91-106. Hobfoll S (2011) Conservation of Resource Caravans and Engaged Settings. Journal of Occupational and Organizational Psychology 84: 116-122. Park Y (2010) The Predictors of Subjective Career Success: An Empirical Study of Employee Development in a Korean Financial Company. International Journal of Training and Development 14: 1-15. Enache M, Sallan J, Simo P, Fernandez V (2011) Career Attitudes and Subjective Career Success: Tackling Gender Differences. Gender in Mgmt: Int. J 26: 234-250. Myrtle R, Chen DL, Fahey D (2011) Job and Career Influences on the Career Commitment of Health Care Executives: The Mediating Effect of Job Satisfaction. Journal of Health Organization and Management 25: 693-710. Christopher J, Maris J (2010) Integrating Mindfulness as Self-Care into Counselling and Psychotherapy Training. Counselling and Psychotherapy Research 10: 114-125. Bandura A (1977) Self-efficacy: toward a unifying theory of behavioral change. Psychological review 84: 191. Stajkovic AD, Luthans F (1998) Self-efficacy and work-related performance: A meta-analysis. Psychological bulletin 124: 240. Day R, Allen TD (2004) The relationship between career motivation and self-efficacy with protégé career success. Journal of Vocational Behavior 64: 72-91. Ballout HI (2009) Career commitment and career success: moderating role of self-efficacy. Career Development International 14: 655-670. Abele A, Spurk D (2009) The British Psychological Society how do Objective and Subjective Career Success Interrelate over Time. Journal of Occupational and Organizational Psychology 82: 803-824. Ugboro I, Obeng K (2015) The Moderating Effects of Perceived Threat to Valued Job Features on Career Commitment Among University Professors. Australian Journal of Career Development 24: 39-52. Creed P, Hood M (2014) The Development and Initial Validation of a Scale to Assess Career Goal Discrepancies. Journal of Career Assessment 23: 308-317. Penny Wan Y, Wong I, Kong W (2014) Student Career Prospect and Industry Commitment: The Roles of Industry Attitude, Perceived Social Status, and Salary Expectations. Tourism Management 40: 1-14. Poynton T, Lapan R, Marcotte A (2015) Financial Planning Strategies of High School Seniors: Removing Barriers to Career Success. The Career Development Quarterly 63: 57-73. Arora R, Rangnekar S (2015) The Joint Effects of Personality and Supervisory Career Mentoring in Predicting Occupational Commitment. Career Dev Int 20: 63-80. Rahman A, Raza Naqvi SMM, Ismail Ramay M (2008) Measuring turnover Intention: A study of IT Professionals in Pakistan. International Review of Business Research Paper 4: 45-55. Subbaiah R (2013) A review of models for predicting soil water dynamics during trickle irrigation. Irrigation Science 31: 225-258. Greenhaus JH, Parasuraman S, Wormley WM (1990) Effects of race on organizational experiences, job performance evaluations, and career outcomes. Academy of management Journal 33: 64-86. Chen G, Gully SM, Eden D (2001) Validation of a new general self-efficacy scale. Organizational research methods 4: 62-83. Kong H, Cheung C, Song H (2012) Determinants and Outcome of Career Competencies: Perspectives of Hotel Managers in China. International Journal of Hospitality Management 31: 712-719. Gefen D, Straub D (2005) A practical guide to factorial validity using PLS-Graph: Tutorial and annotated example. Communications of the Association for Information systems 16: 5. Adeniji A (2011) Organizational Climate and Job Satisfaction among Academic Staff in Some Selected Private Universities in Southwest Nigeria. Doctoral Dissertation, Covenant University. Esser I, Olsen K (2011) Perceived Job Quality: Autonomy and Job Security within a Mulitlevel Framework. European Sociological Review 28: 443-454. Gerbing DW, Anderson JC (1988) An updated paradigm for scale development incorporating unidimensionality and its assessment. Journal of marketing research 186-192. Monis S, Sreedhara D (2011) Employee Satisfaction with Career Development Practices: A Comparative Study of Indian and Foreign Mnc Bpo Firms. Journal of Arts Science and Commerce II. Porter LW, Steers RM, Mowday RT, Boulian PV (1974) Organizational commitment, job satisfaction, and turnover among psychiatric technicians. Journal of applied psychology 59: 603. Rande S, Rahawarin Y, Zacharias T (2015) Factors Affecting the Career Development of Employees in Secretariate Office of City Samarinda. International Journal of Scientific & Technology Research 4. Shrout PE, Bolger N (2002) Mediation in experimental and nonexperimental studies: new procedures and recommendations. Psychological methods 7: 422. Spurk D, Abele A (2014) Synchronous and Time-Lagged Effects between Occupational Self-Efficacy and Objective and Subjective Career Success: Findings from a Four-Wave and 9-year Longitudinal Study. Journal of Vocational Behavior 84: 119-132. Stoffers J, Canisius E (2015) Differentiated Rewards as an Enticement to Display and Develop more Professionalism in Higher Professional Education-Perceptions of Justice among the Lecture Staff. JHRSS 3: 57-65. Virtanen M, Kivimaki M, Virtanen P, Elovainio M, Vahtera J (2003) Disparity in Occupational Training and Career Planning between Contingent and Permanent Employees. European Journal of Work and Organizational Psychology 12: 19-36. Wan YKP, Wong IA, Kong WH (2014) Student career prospect and industry commitment: The roles of industry attitude, perceived social status, and salary expectations. Tourism Management 40: 1-14. Yang F, Lau V (2015) Does Workplace Guanxi Matter to Hotel Career Success? International Journal of Hospitality Management 47: 43-53.